All of the last minute, nervous energy fueled tweaks were completed. The signage was adjusted to perfection, the interactive elements were tested and found to be working seamlessly, and the glass of the display cases was as polished as it ever would be. It was opening night of “If You Have Any Regard for Me Left: Writing Home from the Klondike Gold Rush,” an exhibit that was the result of a long-standing partnership between the UW Museology program and the Klondike Gold Rush National Historical Park and Museum – Seattle Unit. This partnership gives Museology students the unique opportunity to work in teams to design and install their own temporary exhibition at the Klondike Gold Rush Museum. This year, second-year students Caleb Stockham, Katelyn Johnson, Nicole Jarvis, and Gabrielle Friesen debuted an exhibition that chronicles the complex relationship between historic Klondike gold rush settlers and their mail. 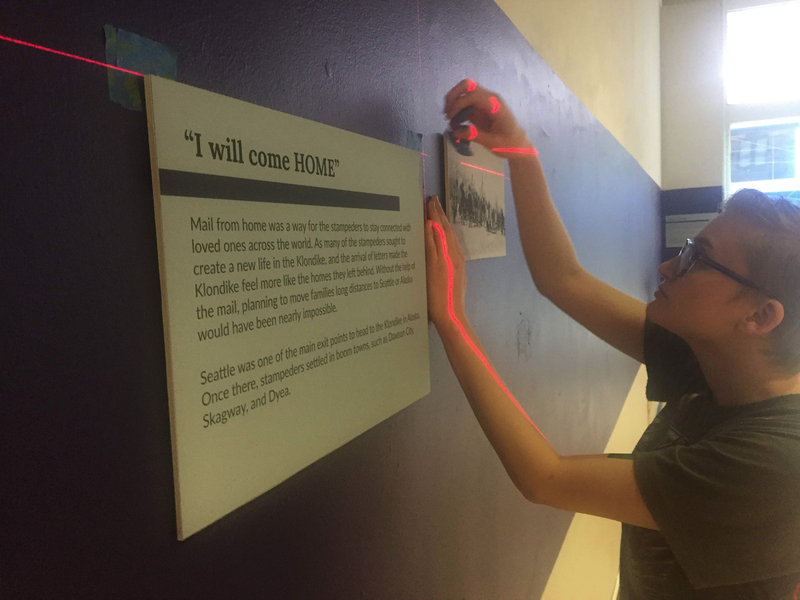 Gabrielle Friesen leveling out labels on the walls of the Kerr Room at the Klondike. Gabrielle Friesen had been involved with the exhibition since its beginning in the introductory Seminar in Museum Exhibition course. I spoke with Gabrielle about her experience working on this exhibit. She recalls jumping at the chance to work with the Klondike staff on this particular topic because of a personal connection to it. 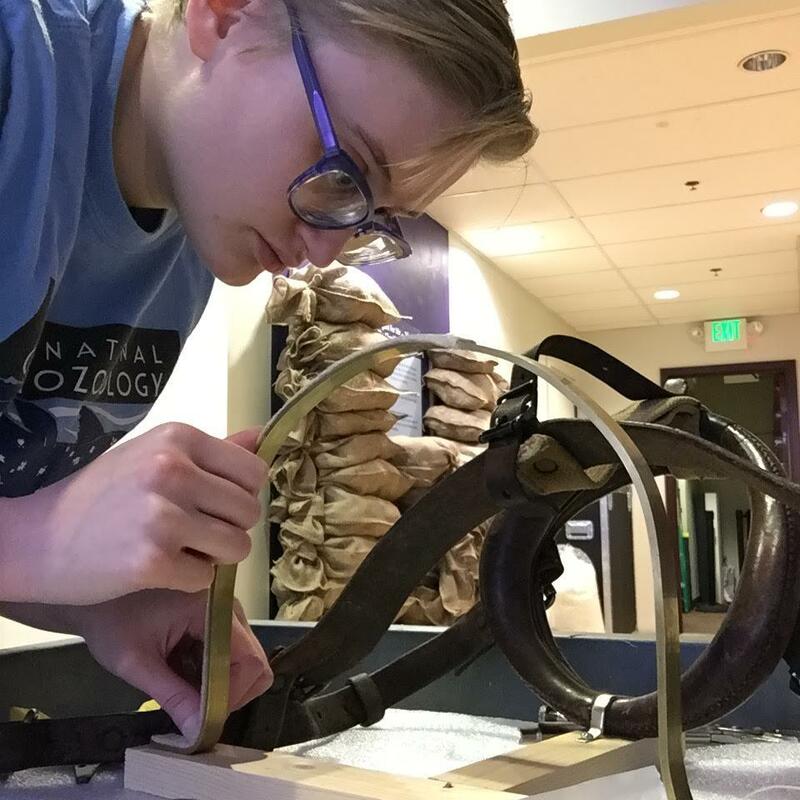 Friesen assembling a complex mount for an unusual artifact – a dog harness. 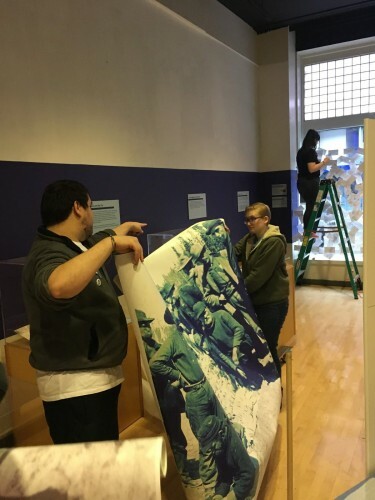 Stockham, Friesen, and Johnson (L-R) working on installation. What better way to end this blog post than a shameless plug? Be sure to check out “If You Have Any Regard for Me Left: Writing Home from the Klondike Gold Rush” and see in person the hard work of UW Museology students, instructor Taylor Felt, and the Klondike staff. The exhibition is currently on view in the Kerr Room of the Klondike Gold Rush National Historical Park – Seattle Unit.